This is an older post but everytime I walk past this room I’m amazed at what a transformation it’s been with such a small amount of time/resources. 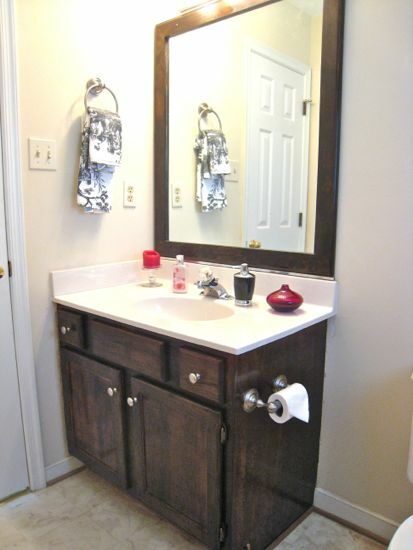 Well…..we decided to go ahead and stain the vanity cabinet and the mirror frame that I made. I spent $4 to construct the mirror frame and then the rest of the project used leftover materials we had around the garage. 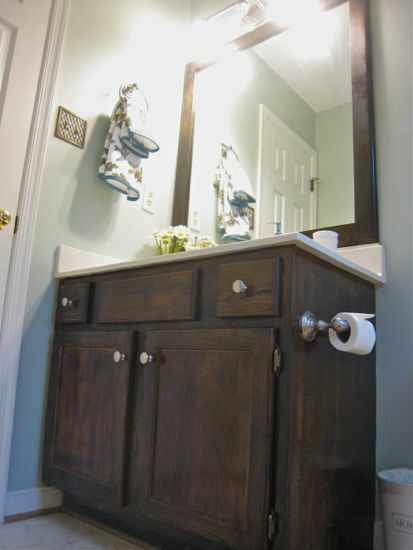 I used some dark walnut stain (leftover from our dining room table-found here), I had some gloss poly just lying around, I had some leftover knobs, and to finish it off…some caulk. 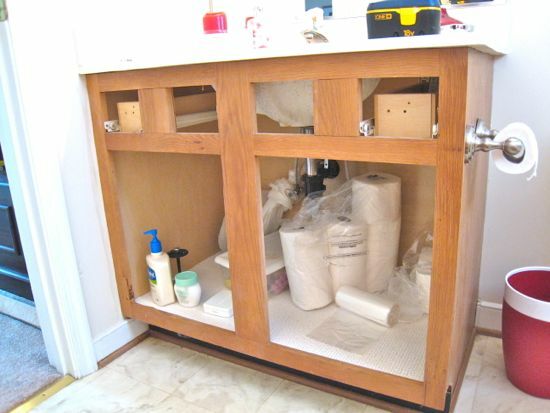 I started the project by removing the doors, drawer faces, and the false front. 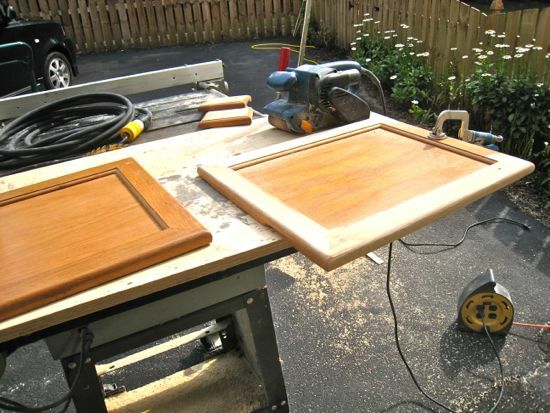 Once I had those removed, I began to sand them down to the bare wood. My new orbital saw broke (don’t worry, I just returned it today and got a new one), so I was forced to use both my palm sander and the belt sander for a little bit. I’ve learned from past mistakes to spend the majority of my time prepping the wood in order to ensure a good finish. After the doors and drawers were sanded down, I sanded down the base cabinet. I taped off the walls so that I wouldn’t sand down the existing paint and for later use when I applied the stain. 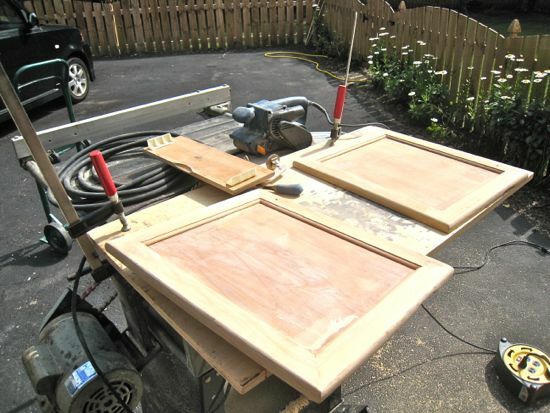 The base cabinet was really hard to sand and I was only able to do a mediocre job at best. The side panel of the cabinet was almost disastrous. After sanding it down for just a little bit, I realized it’s just particle board with no actual wood grain. I thought the project was going to be a total fail because of this….but fortunately, I was able to apply the stain in such a way that appeared to have wood grains. Once sanded down, I applied a nice heavy coat of Dark Walnut stain. I allowed it to dry for an entire day and then applied a gloss polyurethane. It was a fast drying poly but I also allowed that to dry for a full day. After that it was reassembly time with the addition of new cabinet hardware. All-in-all, I spent $4 on the project and just about 4 hours total working on it. What do you think? What it worth it?